BENEZETTE – Honors students in the Penn State DuBois Wildlife Technology program had an exclusive opportunity for hands-on learning recently with members of the Pennsylvania Game Commission’s (PGC) biological staff. The PGC is currently researching reproductive trends among Pennsylvania’s elk herd in hopes of improving the overall health of the herd and increasing the population. To that end, four first-year honors students from the program, with their instructor Keely Roen, joined Elk Biologist Jeremy Banfield and Elk Biologist Aide Avery Corondi in chemically immobilizing a cow, or female elk, so that blood samples crucial to these conservation efforts be collected. “We collected blood samples during our hunting season for elk, which happens in the first full week of November, and we’ve been testing for pregnancy, and it’s been suspiciously low. Around 55 to 60 percent,” Banfield explained, noting that the pregnancy rates in November would ideally be at around 90 percent. While this research is still in its very early stages, Banfield said seeing pregnancy rates increase into the spring is not actually a positive finding. He said late season pregnancy among female elk means an increased mortality rate for their calves and hopes that most cows will be pregnant earlier in the season. Ultimately, through this research, they hope to understand why that isn’t happening. “It’s going to depend on what we find here, what our next step is. When you have either low pregnancy or late pregnancy, it obviously influences the population. So, we are trying to deduce what’s going on here so we can hopefully correct it in the future,” Banfield said. “You want the animals to be bred in as short of a window as possible. Early on in late September is the prime period. The reason is that the rut [breeding season] is rough on both genders, especially bulls that can lose up to 20 percent of their body weight. “Also, nature has evolved this way so that the calves that are born during the end of May, beginning of June, which is the prime time for vegetation, and that’s a good time. Food is plentiful, and they can gain weight fast. “If they’re born late, they don’t have as much time to gain that weight and have lower chances of survival going into the fall, so we don’t want late pregnancy. While these early steps of this research will hopefully reveal why these late pregnancies are happening, Corondi added that it is a confusing set back for the population of a species that otherwise is poised for great survival and reproductive success in the Commonwealth. The process by which samples are collected for this research is challenging, adding another layer of difficulty for these wildlife professionals. They are specifically targeting female elk, three-and-a-half years of age and older. They must first locate a group of animals, visually identify an individual they hope to collect samples from, then close in, getting into range for a clean shot with an air powered gun that fires darts that deliver the immobilizing chemicals that sedate the elk long enough for samples to be collected. The safe range to ensure a chance at a clean shot with that device is about 40 yards. Just immobilizing the animal alone can take a great deal of know-how and woodsmanship. It was this process that Penn State DuBois honors students in the Wildlife Technology program had the opportunity to participate in, an opportunity not open to any other members of the public or community outside of PGC staff. Currently studying to work in the field of wildlife conservation, this exclusive experience gave the students the chance for a real-world look at some of the work they could look forward to completing when they enter their careers. Banfield and Corondi led the group of students from Winslow Hill near Benezette in Elk County, out into the heart of Pennsylvania’s Elk Range at sunrise. They quickly came upon a group of elk and identified a cow that fit their profile for testing. After Banfield made the shot with the dart gun, the group waited about 10 minutes before tracking the animal. They were assisted by radio telemetry that homes in on a signal put out by the dart, and used the device to help locate the elk, which was able to run a couple of hundred yards before she would succumb to the immobilization drugs. Once located, Banfield and Corondi quickly got to work collecting blood, as well as other data from the cow. Banfield said, “While we have her down, we check heart rate, breathing, and temperature, to assure the health of the animal. 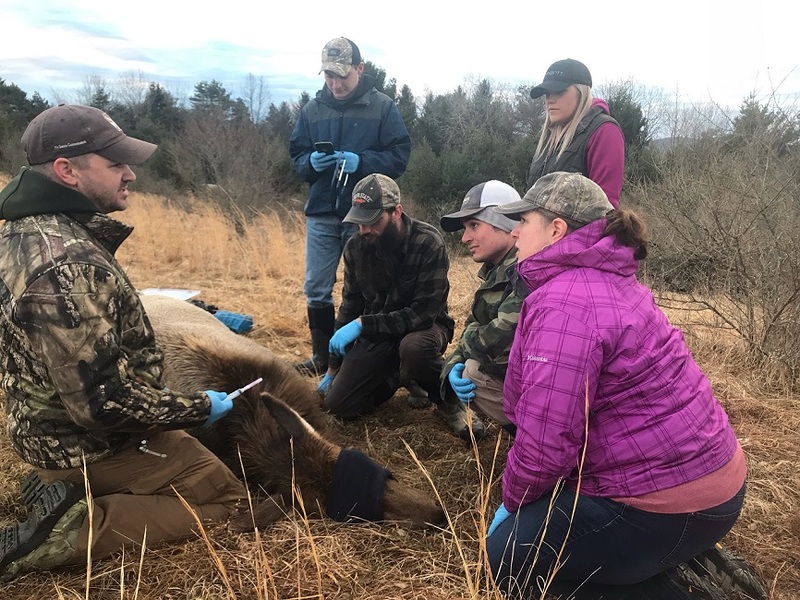 Following the collection of samples and data, reversal drugs are injected into the elk to counteract the immobilization drugs that tranquilized her. All animals studied are monitored until they’re awake and able to regain their feet. In this case, the cow elk was awake and able return to the herd within four minutes after recovery drugs were administered. Getting to be in such close contact to wildlife, as well as the hands-on work that conservations do every day, was and invaluable learning experience for these aspiring professionals. Instructor Keely Roen said the type of inspiration and real-world experience Orcutt is thankful for is exactly why she seeks out these opportunities for her students. She said, “This gives students the chance to interact with professionals in natural resources, and to be part of an experience that they may very well relive five or ten years from now in their careers. Roen said the students participating in this experience will use what they’ve learned to help their classmates take their education one step further, as well. According to Banfield, the elk herd in Pennsylvania was extirpated due to overhunting in the late 1800’s. Beginning in 1913, efforts to bring the species back to the Keystone State began with importing animals from other states. Between 1913 and 1926, 177 elk were introduced into Pennsylvania. That number initially grew to between 400 and 500 animals. Official yearly counts of the species began in 1971, and eventually a hunting season for elk in Pennsylvania was open in 2001 when it was determined the population increased to a sustainable number that could be managed by hunting. Though the current pregnancy rate is alarming, importation of elk as was done in the past is no longer an option due to the outbreak of Chronic Wasting Disease (CWD). An affliction plaguing deer and elk alike, CWD originated in the west and has already found its way into Pennsylvania. There is no cure for the disease, that attacks the nervous system of the animals, and it is always terminal to those that contract it. To prevent the spread of the disease, conservationists have determined that deer and elk should not be relocated. Though it is a threat to deer and elk species populations, no evidence has been discovered that it is harmful to humans. Additionally, Banfield’s opinion as the state elk biologist is that it can be mitigated to the point of sustaining wildlife species. He said, “Our elk will inevitably get it. “When that’s going to occur is always difficult to predict. But when it happens, we have no reason to expect it will wipe out the elk population. Banfield said members of the public should be reminded that feeding elk is illegal, and in CDW areas of the state, feeding of deer is prohibited, as well. Refraining from feeding wildlife will help in stopping the spread of diseases like CWD. Currently Pennsylvania boasts an elk population of approximately 1,000 animals.